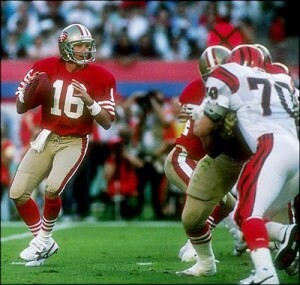 Has there ever been a better Super Bowl performance than Joe Montana in Super Bowl XXIII? Sunday’s Super Bowl will feature the most prolific offense in NFL history against a squad that has a dominant running back and budding star at quarterback. Who will rise as the greatest star of the biggest game of the year? While Super Bowl history is full of second tier players having a career day, it is also full of future Hall of Famers who rose to the ultimate occasion. This article marks part two of our look at the top 50 individual offensive performances in Super Bowl history. Of the 50 performances picked for the list, 31 were by players who either are in the Hall of Fame or should realistically expect to receive a bust in Canton at some point. However, when you look at the “best of the best” performances, 19 of the top 25 were by players who are Hall of Fame caliber. So, as we look toward Sunday, expect the cream to rise to the top and the top performers to be from marquee players like Peyton Manning, Marshawn Lynch, Demaryius Thomas, Wes Welker and Russell Wilson. However, I wouldn’t put it past Julius Thomas, Eric Decker, Golden Tate, Percy Harvin or Doug Baldwin to emerge as a Super Bowl hero. Here is a look at our picks for the 25 best individual offensive performances in Super Bowl history. For this list we looked at statistics, but also considered game situations. That is why the Super Bowl where Joe Montana threw 5 touchdowns was highlighted in the first look at performances 50-26 and two others where he arguably wasn’t as statistically dominant are included here. 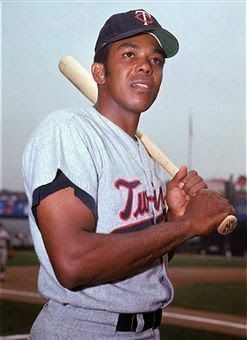 We did take into account whether the team won the game, but did not give any weight to who won the game MVP Award as there have been many occasions where you can scratch your head at who received that award. Be sure to check out part 1 with numbers 50-26. I welcome your comments or ideas as to which performances you think should be on this list. Even though Joe Montana already had a Super Bowl ring prior to facing the Miami Dolphins in Super Bowl XIX, he was generally considered the “second quarterback” entering the big game. Conventional wisdom was that Miami’s big armed quarterback Dan Marino was going to blow away Montana and the 49ers. As it turned out, Montana and his team proved dominant in a 38-16 victory. Montana passed for 13 more yards and tossed three touchdowns with no picks, compared to one TD and two interceptions for Marino. Max McGee was an unlikely hero in Super Bowl I. It was no surprise that the Green Bay Packers defeated the Kansas City Chiefs in the first Super Bowl, but it was quite a shocker that one of the stars of the game was aging wide receiver Max McGee. Having caught just four passes in limited action during the season, McGee expected his biggest score of the weekend to be when he broke curfew the night before the game. 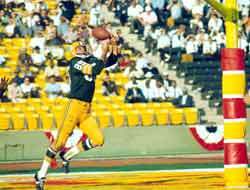 Yet, after Boyd Dowler suffered a broken collar bone in the first minutes, McGee made history by scoring the first touchdown in Super Bowl history. Before the 1999 season Kurt Warner had thrown all of 11 passes in the NFL. In Super Bowl XXXIV he threw the ball 45 times for 414 yards (still the single game Super Bowl record) to lead the Rams to a 23-16 victory over the Tennessee Titans. The Rams marched up and down the field, but were held to just three field goals in the first half and the Titans came all the way back to tie the score at 16. Warner then connected with Isaac Bruce for a 73-yard touchdown that proved to be the game winner. With his team trailing 17-9 after the New England Patriots scored on the first drive of the second half, Eli Manning completed 17 of 23 passes for 176 yards to lift the New York Giants to their second Super Bowl victory over the Patriots in five years. He was especially impressive when marching the Giants down for the game-winning touchdown as he completed five of six passes for 74 yards. Aaron Rodgers didn't have just one great game, his play throughout the Playoffs lifted Green Bay to the title. With his MVP performance in Super Bowl XLV, Packers quarterback Aaron Rodgers has just completed on of the finest postseason runs in NFL history. In light of this accomplishment and recent articles about the greatest individual performances in NFL playoff and Super Bowl history, here are the 10 greatest performances over the course of a single postseason in NFL history. Thomas showed his versatility as he gained 544 yards of total offense in three games during the Bills’ first of four runs to the Super Bowl. Thomas run for more than 100 yards in all three games, rushing for 390 yards on 72 carries and scored four touchdowns, to go along with 13 catches for 154 yards. But Buffalo fell short of winning the Super Bowl as Scott Norwood missed his potential game-winning field goal against the New York Giants. 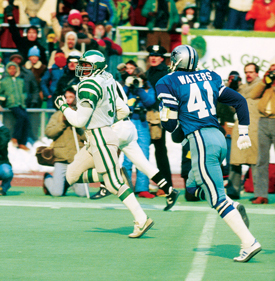 The Cowboys couldn't catch Wilbert Montgomery as he rushed for 194 yards to lead the Eagles to their first Super Bowl. Last year, I wrote an article detailing the 50 most memorable moments in NFL postseason history. This year, I have decided to chronicle the 40 Greatest Individual Performances in NFL Playoff History. This list spans back to the beginning of the Super Bowl era in 1966 and does not feature any performances from the Super Bowl. Patriots cornerback Ty Law intercepted Peyton Manning three times to help lead his team to a 24-14 win over the Colts to send New England to their second Super Bowl in three years. In the game following Law’s performance, Panthers rookie cornerback Ricky Manning Jr. picked off three passes in his game to his team to a win, a 14-3 victory over the Philadelphia Eagles. Normally used as a kick returner, Darren Sproles had to fill in at running back for the injured LaDainian Tomlinson in the Chargers’ Wild Card Game against the Indianapolis Colts. Sproles rushed for 105 yards on 22 carries, to go along with five catches for 45 yards, four kickoff returns for 106 yards, and three punt returns for 72 yards, totaling 328 yards of total offense, the third most in playoff history. 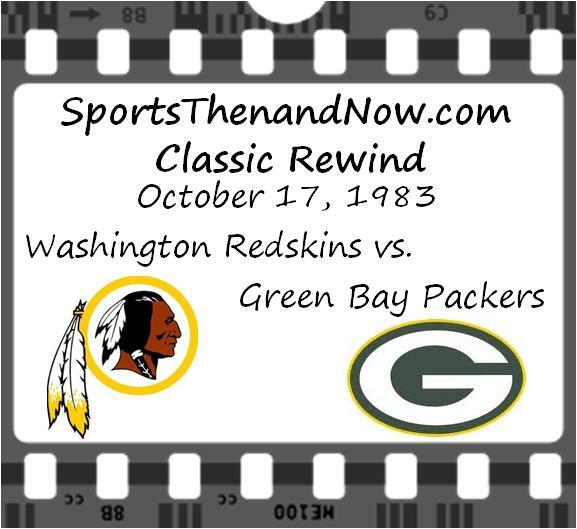 Many fans were hoping for a shootout when two of the most high-powered offenses in the NFL, the Washington Redskins and the Green Bay Packers, got together for a week 7 Monday night game in Lambeau Field. The Redskins were the defending Super Bowl champions and entered this game with a 5-1 record, their only loss being a 31-30 loss to the Dallas Cowboys in week 1. Quarterback Joe Theismann had all sorts of his weapons with a backfield that consisted of running backs John Riggins and Joe Washington to go along with a great corps of receivers known as the “Fun Bunch” for their end zone celebrations, Art Monk, Charlie Brown, and Alvin Garrett. But the heart of the Redskins’ offense was in its offensive line, known as the “Hogs”, who were able to dominate the line of scrimmage to provide huge holes for their running backs and allowed Theismann the time to find his receivers.